WHY CHOOSE A CERTIFIED SPECIALIST IN SPORTS DIETETICS? 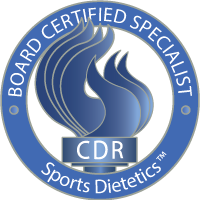 The Board Certification as a Specialist in Sports Dietetics (CSSD) credential is the premier professional sports nutrition credential in the United States. CSSDs are registered dietitians who provide safe, effective, evidence-based nutrition services for health, fitness, and athletic performance. The CSSD was developed by the Commission on Dietetic Registration (CDR), the credentialing agency for the American Dietetic Association, the nation’s largest organization of food and nutrition professionals. CDR is an organizational member of the National Organization for Competency Assurance. You are an athlete who has a medical condition, e.g., diabetes, cardiovascular risk factors, compromised bone health, abnormal iron status, food allergies, or gastrointestinal problems such as gluten sensitivity, and you want nutrition guidance and a personal meal plan.